The Vacation Bible School - VBS Certificate is great award to give to the children on the last day of VBS to show your appreciation for their attendance and completion of VBS. There are three different Vacation Bible School Certificates below for free to download and print for your next Vacation Bible School. 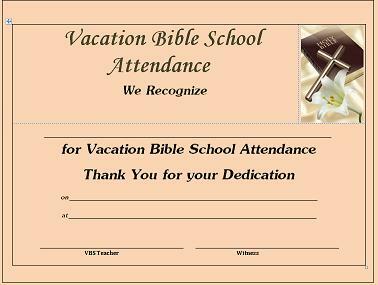 The Vacation Bible School Attendance Certificate above can be given to your children for just simply attending VBS. These type of awards and certificates make the children feel proud to have attended these classes and gives them a keepsake to remember the Vacation Bible School later on in life when they get older. There are two Vacation Bible School Certificate of Completion awards below that can be given to the children that have completed VBS. When the children have finished Vacation Bible School they will be able to frame one of these beautiful certificates below and also have a keepsake and memories of what they learned about the Bible and also all the fun they had learning. Vacation Bible School is a tool where churches can hold a week long event of Bible study with the children and help them learn and have fun activities at the same time. Most of the time VBS is held sometime during the summer months due to this is when children are out of school. July is somewhat a popular month to hold Vacation Bible School, but can be held when your church prefers. Return to Church Certificates from Vacation Bible School Certificate. Return to VBS Ideas from Vacation Bible School Certificate.